All three axes have a hardened box-way design . In addition, the spindle headstock, column, saddle, base, and table are all made of high-quality Meehanite cast iron. Three spindle alternatives of spindle are available. An enhanced headstock design allows the spindles to run up to 10,000 RPM. All spindles and pulley assemblies are dynamically balanced. A non-slip timing belt ensures the spindle will run smoothly, even at maximum speed. The gear-driven cartridge spindle is capable of reaching speeds of 6,000 RPM. There is a dramatic increase in spindle rigidity due to increased spindle bearing support. 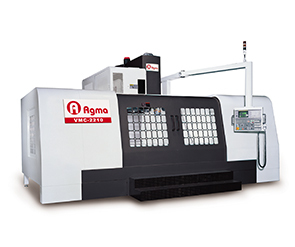 This along with a high horsepower spindle motor dramatically enhances the machine's cutting performance. In addition, each gear-driven spindle has a spindle oil cooler used to lower bearing temperature and prolong the spindle life. The exclusive honeycomb shape structure design is utilized on the Column of VMC-2210. This design reinforces the headstock support and also enhances the stiffness of the structure. A high stiffness to weight ratio allows excellent dynamic performance during cutting. The base of VMC-2210 has 6-hardened ways that allow greater stability. Therefore, the saddle and table are fully supported along the entire X and Y-axes travels. To prevent the deviation of servo motor housings and bearing housing, two stoppers are equipped for each axis to guarantee absolute axial alignment. Spindle options include coolant through spindle with standard maximum pressure of 20 bar (280 psi). Higher-pressure ratings are also available. All electrical components are in compliance with all safety rules and regulations. All components inside the cabinets are clearly labeled and identified for ease of troubleshooting. This option is installed with the fully enclosed splash guard. The work lights are located on the upper right hand corner and left front side, providing a well-lit table area. Metal steps allow the operator to load and unload work pieces easily . 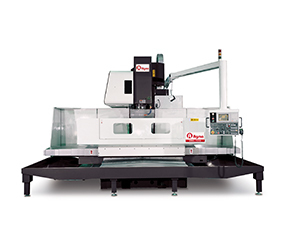 This feature is designed for easy operator access into the machine. All three axes use ISO Class C3 precision ground pre-loaded ballscrews with pretensioned supports on both ends to minimize backlash and compensate the thermal induced error. Unique AGMA designed double deck table. This unique design increases the load capacity of worktable for more variety applications, and also minimizes the deformation induced during heat treatment process.